The Association of Plumbing and Heating Contractors (APHC) have finally released the results of their independent research and the results have been described as “Startling” by much of the trade press. The research was carried out by DJS Research in order to support the Association’s case about the need for improvements to enforcement procedures to government. We recently reported on APHC’s pledge to lobby government in a bid to improve trading standards in the plumbing and heating industry. This follows a series of summits held on the topic at Westminster, chaired by Lord Martin O’Neil and supported by key industry bodies. The initial phase of the research involved gathering information from local authorities across England and Wales under the Freedom of Information Act. The number of building control officers available to deal with notified work and enforcement actions related to Parts G and J of the Regulations. Out of the 359 city, borough and district councils contacted, a total of 250 responses were received. As you can see from the infographic there are a number of similarities and also differences between heating and the water / sanitation industry. Many more companies undertaking work on boilers and heating (B&H) are aware of sanctions or consequences of non-compliance than those working on sanitation and water (S&W). The independent research also found that APHC members were more likely to be aware of regulation changes, 94% compared to 84% of non-members in B&H and 86% compared to 70% in S&W. There is a big difference between B&H and S&W when it comes to reporting non-compliance with 58% of S&W compared with a large majority of 78% on the B&H side. It would appear that there is also a lack of awareness from the public with a majority (69%) of B&H and S&W companies agreeing that customers are willing to breach building regulations to save time or money. “The findings of our new independent research present some frankly shocking evidence of the need for reforms to the enforcement of Building Regulations in our industry. The contractors we surveyed reported encountering regulatory on-site breaches of work on an ongoing basis; set against this is the current low level of enforcement action taking place. 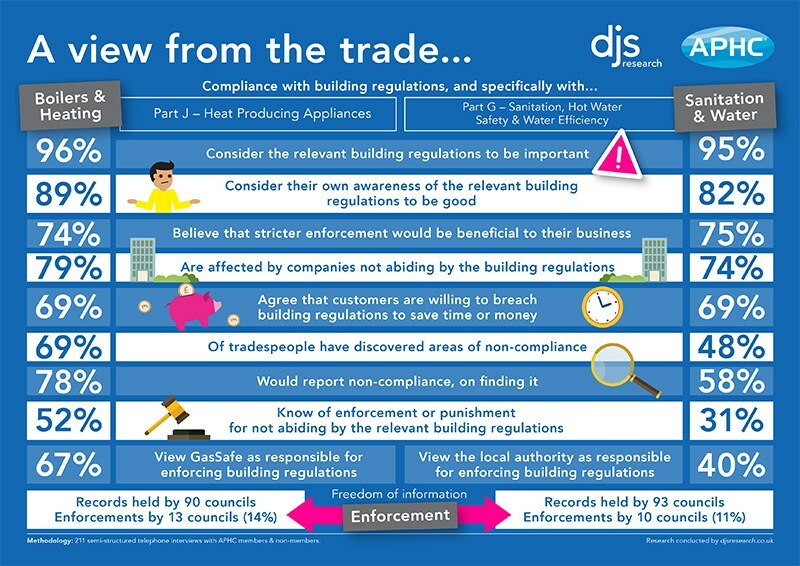 The findings outlined from the research demonstrate that the current system does little to support the quality plumbing and heating contractor endeavouring to comply with legislation and safe working practices when competing for work. We look forward to moving this important project forward with our industry partner organisations by presenting our findings to government later in the year.